As we are now into winter and possibly your first overnight hike. You may not have the gear you need. But you don’t want to spend a fortune maybe not much at all on gear. There are several options to getting hold of some cheaper or free gear, lets look at them. The over $50 basics you just must have are a one-person tent, sleeping bag and sleeping mat. A 2 person tent can be shared a with someone else. A tent must be carried on the Bibbulmun Tent even if you plan to stay in a hut/shelter. 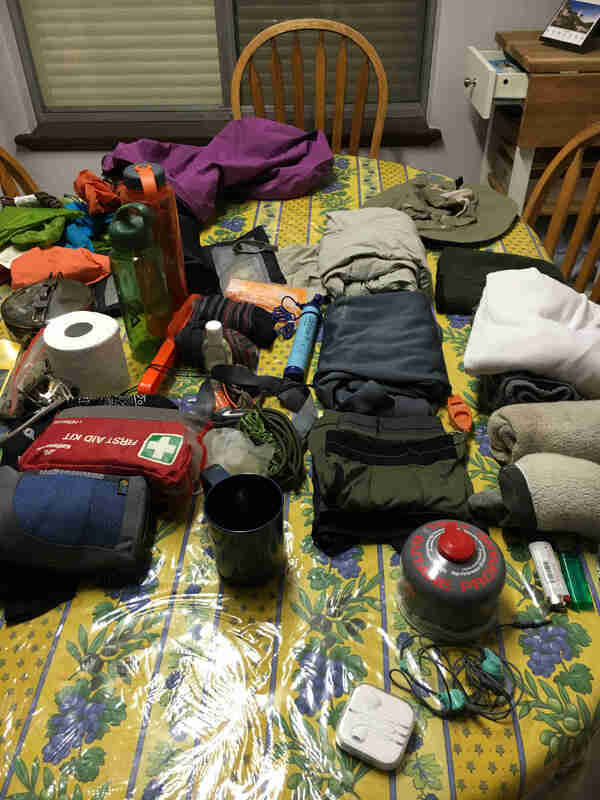 Gear needs to be suitable for hiking, smaller and lighter the better. Most of us would like to carry lighter gear, but hiking is about being real not always comfortable. During my end to end of the Bibbulmun track, I carried an average of 19kg which I do not regret. It helped me become the hiker and person I have become now. Find out what your limit is. As long as you can carry it in your pack and it all weighs 17kg, that is reasonable to expect. From your family and friends – Hiking and camping gear is something many people have in the shed and forgotten. They would be happy to see it used and you may also be able to keep it after or buy it off them after you try it out. But a warning check the gear, put up the tent, don’t assume it was looked after even if it wasn’t used. The only reasonable place you can hire gear in Perth is the Bibbulmun Track Foundation; but they are very heavily booked during the hiking season. You can hire a tent, sleeping bag, sleep mat, everything you need. They only carry good reliable gear as it is hired out to end to enders. You can purchase reliable 2nd hand tents online as my friend Louise and I discovered. Two one person 3 season tents for $100. The biggest consideration is that it’s a 3 season tent so can take the heavy rain, it can fit on or in your pack and its not too heavy. 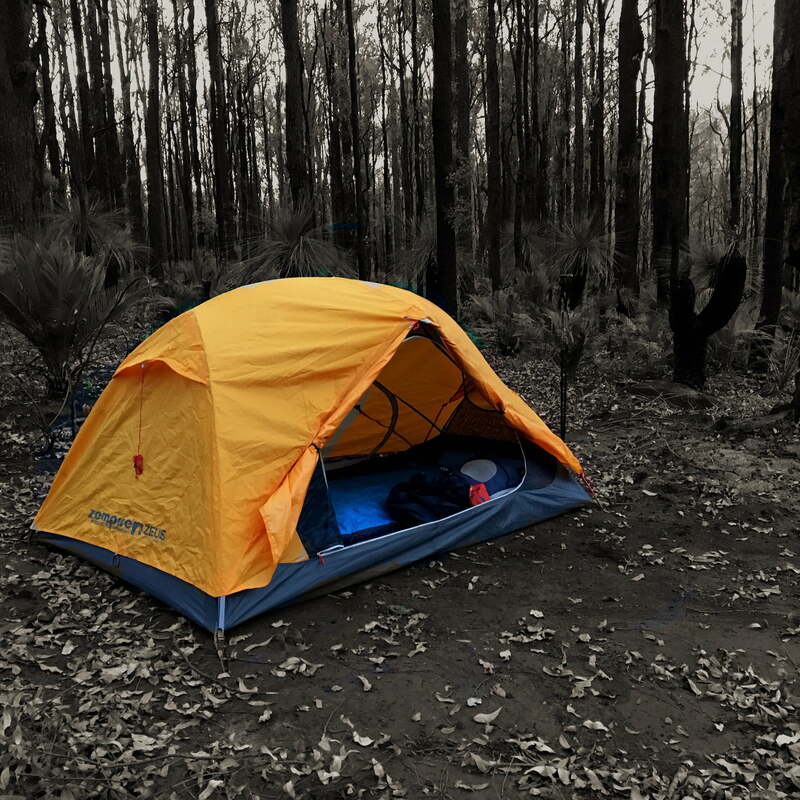 You can expect a suitable one person tent to weigh around 1.8kg. You can find much lighter, but the price increases dramatically. A 50 to 70 litre backpack is the typical size for overnight hikes. You can easily buy 2nd hand packs online on either Facebook, gumtree for instance. You will find everything from dodgy, to unsuitable to quality bargains. Do your research beforehand on brands but mainly features and then search for that. I have recently seen 50 to 70 litre packs going cheap online which may sound great. But they are unsuitable for hiking because they are designed for climbers. They are long very narrow packs, which are difficult to pack with everything you need. A reliable and comfortable hiking sleeping mat is important if you want a good night’s sleep. When you are hiking for a few days, you can expect to be using your mat around 10 hrs a night because you need the rest to recover. The risk in buying a 2nd hand mat unless you buy it early and test it out at home a few nights is obvious. Do not leave the repair kit at home, been there done that, fortunately I have not needed it but it’s useless at home. If you want to buy new, look out for clearances, try cheaper stores like Anaconda, buying cheap mats like anything online is risky. Though check out online eBay stores read reviews on gear. I haven’t included footwear on this list because all I ever recommend is comfortable walking shoes or boots. Walking shoes must have good grip. Whether you use shoes or boots is a personal choice. My brother in law and nephew have used their Big W hiking boots which cost under $40 for now over 120km, no complaints from either about comfort or quality. I do most of my research on Youtube, by asking my hiking friends, other hikers then I make up my own mind. Unfortunately, advice I have received from a few different cheaper outdoor stores or who also sell non-hiking gear on more than one occasion which I won’t mention here was bad even potentially dangerous. A Manager wanted to sell me a sleeping bag that was no where near warm enough for the conditions I told them about. Then a young sales person was arguing with me about a tent they said was a big one person but was obviously 2-person tent. They then insisted that the 2 after the name was the series not how many people it is designed to carry. Buy from the cheaper stores but research elsewhere. You are always welcome to contact me about gear but I will also tell you Hike your Own hike extends to your gear. There is so much pleasure in researching and making up your own mind.